Verify the status of different Flipsnack services in real time. Because we want to be transparent to our users, you can now check the status of our platform in real time. Keep reading to find out how. 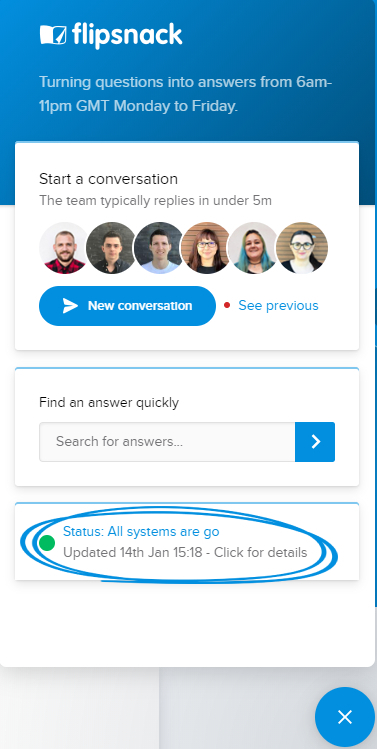 Once you open the live chat overlay down in the right corner of your browser, click on the status panel at the bottom of the window. Custom Domain- Find out if there are any issues on our side regarding white-labeled sub-domains. Link detection in PDF- Find out if our link detection service is up and running. If you have any questions regarding this option, please contact us via our live chat.